Do you or a loved one live with a disability? 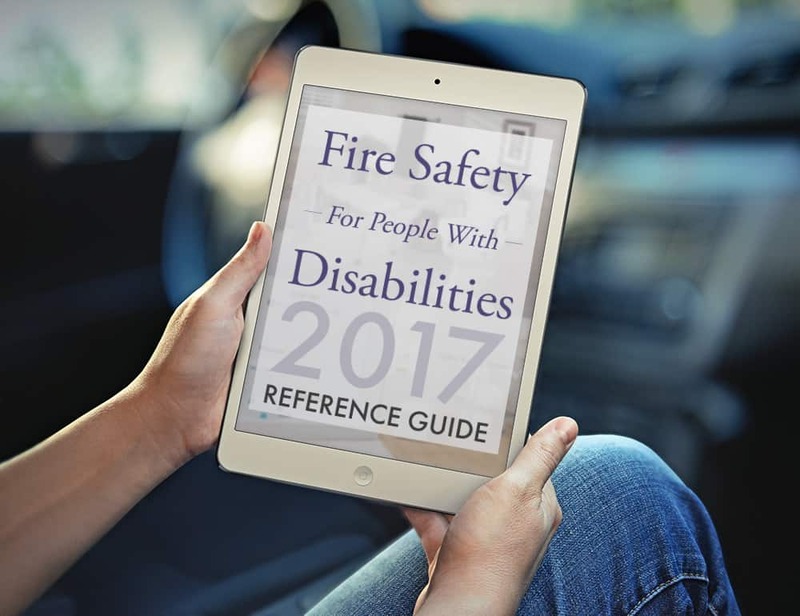 Fire safety systems are often simply kept up to building code, without adding an extra degree of preparedness and accessibility for those with disabilities. IF YOU WANT TO ENSURE YOUR LOVED ONES ARE SAFE AT HOME (AND WHO DOESN'T?) THEN THESE STEPS ARE ESSENTIAL. No worries. Feel free to download a copy of the PDF using the download button below. No email optin required. According to data from the U.S. Fire Administration (USFA), in the interval between January 1st and March 3rd of 2017, “500 civilian home fire fatalities” were reported. Residential fires claim thousands of lives each year. Although we’ve come a long way in developing state-of-the-art alarms and other various implementations that decrease the risk of fatalities, there is a category of people that is in a terrible and immediate need of further specialized fire safety systems: those with disabilities. Spontaneous fires are incredibly dangerous even for the fittest of us, but they are ten times riskier in the case of the impaired, i.e. those who cannot walk, hear or see. Furthermore, in spite of the fact that their houses can be equipped with specific setups that could potentially facilitate their safe passage outside, they cannot install these prevention mechanisms unless they are cared for by relatives and/or hired caregivers. As you can well imagine, this fire safety issue becomes all-the-more severe in the case of those disabled people that are living on their own, without any help from the outside. They are considerably more exposed to dying in fires than those disabled individuals who live with members of their families. The objective of this guide is to provide safety measures for this imperiled group by offering escape plans, some modern phone applications for alerting the authorities in case of danger as well as solutions to a variety of scenarios that might befall the disabled. First of all, let us outline a brief presentation of the impairment categories. This way, we can understand the dangers that their representatives would face. This type of disability includes people who suffer from partial or total blindness or are going through a slow process of recovering from eye injuries that have rendered them blind temporarily. In all three instances, they would be threatened by fires due to their limited or nonexistent sight. Sight is our most helpful faculty because it allows us to assess the severity of the dangers around us. Even though blind people have sharpened hearing and a more developed tactile sense, that’s not of much help in case of a hazard. This category includes people who are deaf or suffer from mild deafness (synonymous with “hard of hearing”) and are using hearing-enhancing kits that they may remove at night. These representatives would also be jeopardized because they may not hear certain frequencies/ pitches. So, the fire and smoke alarms would not be of much help. This category is represented by all those people who are suffering from any kind of disability that limits or nullifies their ability to move. Subsequently, they are confined to wheelchairs. Even though their response time to alarms going off is intact, they would have difficulties in getting out of the house. When we can see the extent of the fire, our brains immediately try to provide us with the safest way out. When our sight is damaged, however, getting out is difficult or downright impossible. It is a fact that blind people have all the remaining senses more advanced. The sound is one of their primary guides. While this is a genuine perk in 90% of the cases, the high-pitched noises of a smoke alarm can easily disorient them. The sound is so intense that it covers those sounds they could have used as cues. The main steps one has to take in order to see him/herself out during the fire (the commonplace testing of the doors, staying low, dropping and rolling) are tasks that blind people could hardly manage to do. For the visually impaired, even the tiniest kitchen fire can have disastrous consequences. They can even start fires accidentally, and because they are unable to locate it, the flames can extend in a matter of minutes or even seconds. In this case, their tactile, olfactory and hearing senses would offer very little help. Visually impaired people must subject themselves to thorough fire drills. They must practice at least two exit routes in their homes in order to leave as quickly as possible if a fire starts anywhere in their residences. Because they can start fires when cooking, it is recommended for them to wear tight clothes when cooking on an open flame. They should also stay in the kitchen until the food is done and never take the timer of the oven for granted. Since many people use radiators and other types of portable heaters, these devices must be unplugged when going to sleep. They can catch fire either by overheating and melting down or overloading the socket. It is not uncommon at all for visually impaired people to have pets that have been trained to assist them in a variety of tasks, fire safety inclusively. If that’s the case, it is advisable to practice those exit routes with your animal companion. Many persons often disregard to train their pets from this perspective, but their help shouldn’t be underestimated. When it comes to fire alarms, the conventional ones can strain the impaired individuals’ senses up to the point where they become disorganized. In such a case, getting out on the practiced exit route is out of the discussion. Fortunately, there are specially-designed fire alarms for blind people. You can skim through some of these here. You can either purchase an alarm that will make your pillow vibrate, like the ones in the enclosed link, or specialized signals with paused alarm cycles. This means that they will stop for a period of time before going off again, allowing you to hear other sounds and guide yourself to a safe place outside. If you are a smoker, don’t leave a lit cigarette unattended. Fires have a tendency of bursting when people are asleep, which slows their response time. This issue is even more severe when it comes to blind people. What you would typically want to do once you wake up and you smell smoke is to get going on the escape route without losing a second. Even though specialists have come up with all sorts of alarms for the blind, this aspect of blind people sleeping while a fire is starting is largely overlooked. It is extremely important not to panic. This is the situation in which a dog comes in very handy. It will definitely wake you up either by barking or trying to get you out of bed. Considering this aspect, you should consider having a pet. It’s not just about companionship – a well-trained dog can truly make the difference between life and death. In case of fire, never stay behind trying to save objects; you shouldn’t even consider putting a price on your life. If you feel smoke, crawl on the floor on the practiced escape route until you’ve reached outside. Touch every door in your way – if a door is hot, do not open it. Being blind is certainly a major impediment when talking about fire safety. Still, thanks to the rapid evolution of the technology, a lot of demarches have been made and are still being done to create functional fire security systems that can compensate for the lack of sight. This disability comes with its own set of life-threatening disadvantages related to fire safety. Hearing impairment can be total or partial, but it is nonetheless problematic in both cases. People can be in danger no matter if their impairment is congenital or the consequence of an accident that can be slightly alleviated by using a hearing enhancing device. The prevention steps for those suffering of hearing problems are not that different from those that apply for the visually impaired. Such patients can also use specially-crafted alarms. This circumstance has permitted the creation of “stroboscopic” alarms. Their use is warranted by the National Fire Protection Association (NFPA). A stroboscopic alarm differs from a normal one because it does not rely on piercing sounds to wake you up, but on intense, ever-changing bursts of colors. Vibrating alarms are a good choice, as well, especially those that you can keep by the bedside or with you at all times. These are able to shake your pillow and wake you up in case of fire. In case you are not in or near a bed, it is ideal if your smartphone can alert you to any smoke or fire detected. Some of the best home alarm systems we’ve analyzed, such as Frontpoint and Link Interactive, both provide remote notifications/alerts via their Android/iOS apps in the case of any fire detection. This way, you’ll know about it even when away from home. Being hearing impaired does not make this category of people exempt from exercising escape routes, at least two. Fire safety is something we can all contribute to through continuous exercise. It’s recommended to make fire drills once in a while and to check the alarms in order to lower the risks of malfunctioning or of not working altogether. If a fire starts in your house, the same steps that applied in the case of blind people apply here too. The laws of getting out alive from a fire are universal and unanimous. They remain the same even for people with impairments, though they should be reinforced with special alarms and escape routes. One incredible source of information concerning the best methods of assuring fire safety for those that suffer from any impairment is the firefighter department. Professional firefighters should be the only persons that impaired people should consult with to make all the demarches that are necessary for ensuring their safety. An impairment that leads to limited or no mobility at all raises many safety concerns in the event of a fire. When we can see the extent of a fire or when we can hear the alarm going off, we are supposedly be able to quickly leave the building. This is easier said than done when you are unable to just get up and run out. Walking with a cane, too, would decrease a person’s chances of reaching the safe point outside in case of fire. Typically, people with mobility impairments are cared for, because they cannot perform even the simplest of tasks on their own. This is an advantage, of course, because if a fire is threatening the building, their caretakers can take them outside immediately. A great issue in this context is the wheelchair itself. For example, it may not fit on each corridor of the house, or at least not without some effort that would take a few minutes one cannot spare in an emergency situation. This is why the mobility impaired require a special design of their houses, with corridors that are at least 1.5 m wide. If this is not possible, the escape route should be established and practiced on via the largest hallways in the house. And if we are treating this subject of home design, we must mention another aspect that is vital to it: thresholds can be a real problem. So, the idyllic situation would be that in which there are none in the house. They can make the entire process of leaving your residence extremely difficult or even impossible. It’s a surprise that you don’t find these tips everywhere, given that thresholds really are a complication that can be avoided. The same rules from above apply here, too, but there is an additional tip. Since mobility impaired people cannot drop down and roll, it is recommended for them to install small fire extinguishers in the proximity of their beds. They can even have one in an easily accessible spot on their wheelchairs. This will allow them to clear their way when following the escape route. In all three categories, smoke and fire detectors are indispensable. However, if your escape route is blocked by the fire and you are trapped inside the room, you should close all doors between you and the fire and cover every spot that smoke could filter through. One such area is the one between the lower edge of the door and the floor. Use clothes or towels for this. After that, call 911 immediately and tell them which room you are in, so the firefighters know exactly where to find you. Most of the times when somebody is stuck in a place, they make the mistake of forgetting to communicate their precise location to the firefighters. This makes their saving a lot more difficult. Here, we’re talking about multi-resident housing and living centers for impaired elderly and children or those who have more than one impaired member in their families. In such cases, the question of fire safety is even more severe. It’s a lot easier to assure safe passage for people in case of fire when the number of the caretakers is equal to the number of the disabled. It would also be great if there is at least a caretaker for every two patients. “Everybody-out” and “protect-in-place” are two notions that any householder should be familiar with. The former represents the urgent expulsion of the disabled outside. The second refers to taking all the measures necessary in protecting them if getting out is not possible until the firefighters have reached the premises. There’s no secret that it is much easier to ensure safety when more healthy people are involved in caring for those that are impaired. However, this does not annul the importance of frequent and detailed fire drills. If a fire occurs, everybody must know what to do, unless a chaos breaks loose. When you have to deal with people that are running in an unorderly fashion, that advantage of having more helping hands is rendered useless. Caretakers face a lot of difficulties in getting all people to behave in the same manner in case of fire. At the same time, they must take into consideration the psychological implications. Anxiety is a real problem. There are people that can be susceptible to hyperventilation, as well as physical freezing in scenarios of extreme dangers. It goes without saying that caretakers should be prepared for such cases. They can be prevented through courses of fire safety education. The “buddy” refers to a technique of evacuation that allocates a healthy helper for each impaired person. This way, a hearing impaired individual will be woken up and carried to safety by his buddy, a mobility impaired individual will be assisted by his buddy in the evacuation process and so on. Of course, this will not work unless proper fire safety education courses are given to the entire personnel of an institution for the disabled or the families that have disabled members. The implementation of this method, however, does not reject installing fully-functional smoke detectors and fire alarms. Specialized ones may not be necessary if everyone is well-instructed. Still, in order for this to happen, caretakers must conduct well-thought training sessions and provide an extensive fire education program for all those they are taking care of. This, of course, applies to families, as well. Until now, we’ve seen the importance of the human factor in this lengthy equation of fire safety, but as technology is always evolving, mobile phones can be equipped with applications that can facilitate the lives of the impaired. Although they are still few, the fact that they exist indicates that efforts are being made in creating applications that could potentially save lives. This is an incredibly comforting thought. Let’s take a look at some of these apps one could use in emergency situations when no one is around to help. AMagnify: AMagnify is an Android application that transforms the smartphone into a magnifying glass. It is especially useful to those that have low vision since it could help them detect the source of the fire and evacuate themselves as fast as possible. The application costs $1.31, and it can be bought in the Google Play Store. Be my eyes: Be my eyes is currently available for iPhone, but it will be soon available for Android too. This is a goldmine for people who are suffering from The application establishes a video connection with volunteers that want to offer their help. This way, in case of fire, a blind person could be carried out to safety by being guided in real time by a helper. The application is not obscure. According to the article that has been dedicated to it on goodnet.org, there are more than 90.000 sighted people using the app, and 7.000 blind persons registered on Be My Eyes. This app offers real chances to individuals in need, and it also stands to show that together we can accomplish anything. It actually offers blind people eyes, and it should be an indispensable app on the phone of a visually impaired person. TapTapSee: This is a free app for iOS that can describe everything around you. It is very simple to use: you double-tap on the screen, the phone will take a photo, and it will upload it for processing on its servers. In a matter of seconds, you will be provided with an accurate vocal description of the photo. In case of fire, it turns out to be extremely useful. RogerVoice: If the first three apps were dedicated to blind or visually impaired people, RogerVoice is extremely helpful for sufferers of hearing impairments. This application converts phone calls to text; when somebody is talking to you, you can read the text. The application has been launched as of March 2015, and it is available for Android. EarMachine: EarMachine functions as a sound enhancer. It will allow you to hear sounds clearer, no matter how noisy the environment is. It could be extremely helpful in case of fire since it will enable you to listen to the alarm or the advice of the firefighters. The settings can be adjusted automatically or manually, and its simple interface makes it very easy to use. Petralex Hearing aid: As its name suggests, the Petralex app is a genuine hearing aid. You can use it with your headphones, and you can adjust the sounds you’re hearing. Moreover, its high-tech built-in microphone captures sounds from a long distance. It is extremely helpful in case of fire, as well. First of all, the escape plan must be discussed with each and every participant and inhabitant of a house/workplace. The major impediment in the evacuation process are the stairs. So, you should also include a method that would allow disabled people to get to the ground level from superior levels. While some can very well descend the stairs on their own or by keeping their hands on somebody’s shoulders, others cannot go down the stairs at all; take the example of paraplegic people. This is the reason why elevators must be fully functional at all times. When the fire alarm goes off, do not panic. Gather your belongings if you have any that you cannot do without. Wait for the assistance to come (if you need aid in the first place). Once your designated assistant has come, go to the refuge point within the building. This area should be established at the fire drills. This refuge point will ensure your protection until the areas that lead outside are cleared up. Make your way towards the final exit with your assistant and try not to remain behind. Let the one responsible for the evacuation know you’ve made it outside safe and sound, to prevent firefighters going inside looking for you and risking their lives in the process. Remain outside at all costs until told otherwise. Fire safety for the disabled must be established between all the individuals that would be a part of the evacuation process. It is not something that people should do on their own, by any means. All the safety measures should be agreed upon in advance, and fire drills should take place frequently, both at the workplace and at home. People that suffer from any of the impairments above can contact the fire department and tell them about their special needs. This way, firefighters will be able to provide additional information concerning fire safety. They can also give useful advice on the fire alarm systems that are appropriate for each type of impairment. At some extent, fire safety is guaranteed once people have been educated properly and once they take all the precautions that are generally accepted and advised. In conclusion, it may be harder to ensure safety in case of fire for disabled people, but it is not impossible. With a little support, lots of training and a few precautions, they can safely get out of a fire.